Marked on the cast iron base weight C & Co., this Cornelius & Company sinumbra is a slightly more diminutive size with its 9" font. 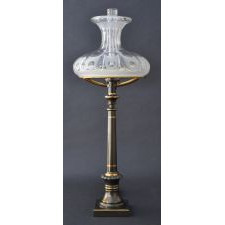 The elegant standard is shown in a patinated finish with gilt highlights. The lamp is completed by a beautiful frosted and cut glass shade.